Update your wardrobe with Joseph Ribkoff's crisp button-up blouse, featuring feminine ruffle detailing. 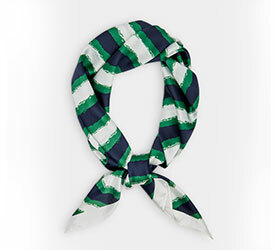 Pair this classic style with straight leg pants. Hand wash in cold water. Do not bleach. Hang to dry. Do not tumble dry. Low iron. Use steam only. Professional dry clean. 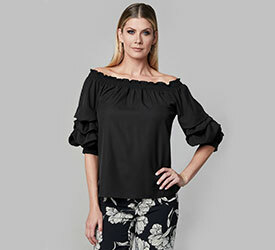 Joseph Ribkoff - Ruffle Detail Blouse is rated 5.0 out of 5 by 5. Rated 5 out of 5 by Deimos from Totally in love with this blouse!! Super flattering on the waist, makes you look slim! Works well with just about every kind of pants since it’s white. I am in love with this blouse and I have received so many compliments from it! Honestly the picture online didn’t look as good as it did in person on me, I am super happy with my purchase! Rated 5 out of 5 by Catherine26 from Great shirt! Nice crisp white shirt. Looks great with leggings. 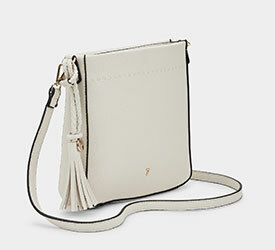 I am pear shaped and found its very flattering and slimming. Rated 5 out of 5 by Laluca from Élégance intemporelle! Un must dans notre garde-robe. Idéale avec un jeans, ou même, avec un pantalon de cuire. Compliments assuré! Rated 5 out of 5 by Princes from Cruise essential Like it with a velvet tasseled shawl! 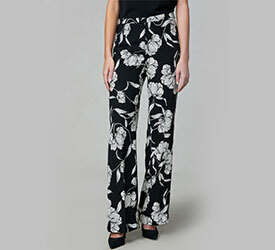 And sunny black ankle pant with medium heels.